3 ft. 5 ft. 10 ft. 15 ft. This Hosa Stereo Mini Male to Stereo Mini Male Cable is a general purpose 5' long audio connection cable with mini (3.5mm) male plugs at both ends. 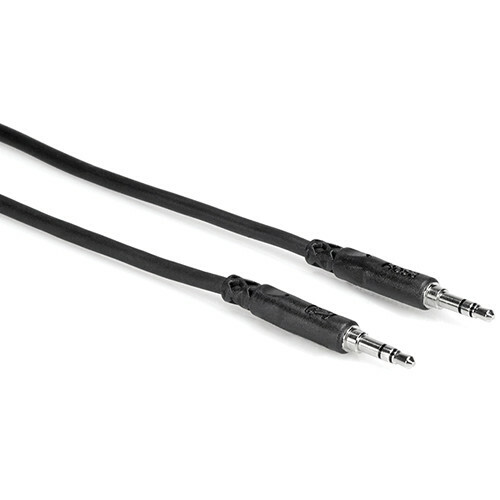 Ideal for connecting equipment that uses 3.5mm (1/8") mini connectors, e.g. computer sound cards, portable CD players, etc. Box Dimensions (LxWxH) 9.75 x 4.15 x 1.25"
Stereo Mini Male to Stereo Mini Male Cable (5') is rated 5.0 out of 5 by 1. Rated 5 out of 5 by Gerry from Hosa cables are my first choice. I use numerous audio cables and have found the Hosa cables meet my rigid standards. I can always rely upon them making secure connections especially in critical applications.